How do you choose a power bank? Safety, capacity, efficiency, charging and recharging speed? NEXGADGET KR-901 must can make you satisfied. 18000mAh high-capacity, High-grade components, world-class chips, cutting-edge circuitry and a rugged double-layer shell ensure reliability and safety. Support charging 2 USB-Charged Devices and 1 Laptop simultaneously at top speed. DC Input and type-C Input, two recharging ways are convenient and speedy. So NEXGADGET KR-901 certainly can meet all your needs and become the best choice. 1. Using DC Power. Please turn on the Power Button, LCD Screen will light and display "DC ON", then the USB Ports can be used normally. If no device connects to the power bank within 25s after turning on the power button, LCD screen will light off and the DC Output of the power bank will be turned off automatically. 2. Using AC Power. After turning on the Power Button, please press the AC Output Button until the AC indicator light lights and "AC ON" shown on the screen, which indicates the AC Output is in normal state. When charging complete, please turn off the AC Power by pressing the AC Output Button until the AC indicator light lights off and "AC OFF"display. 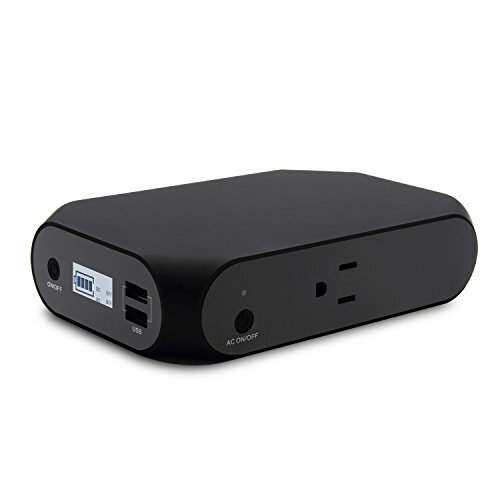 HIGH CAPACITY & SAFE CHARGING: 18000mAh battery charger provides large battery backup for usage during outdoor activities like camping or hiking. Premium Li-ion Battery endures over 500 charge cycles for extended service life. Integrated with voltage surge and over discharge protections, the battery pack will automatically shut down if a charging error occurs. HIGH EFFICIENCY & FAST CHARGING: Simply connect charging cable and this powerful power bank support charging up to 2 USB-Charged Devices and 1 Laptop Simultaneously to save you much time. Almost compatible with all DC / 5V smart devices, including smart phones, cameras, game consoles, tablet PCs and so on. USB1 Support Quick Charge, output power reaches to 5V/7V/9V--2A. USB2 is ordinary output 5V/2 A. AC output 110V/60Hz or 220v/50Hz. SPEEDY RECHARGING: 2 recharging methods, DC Input and type-C Input. Type C Input, used conveniently, more faster and safer than ordinary connectors. Support Fast Charge, at the top speed, 4 hours is enough to get fully recharged. Recharging the power bank with the 15V-19V/2A DC input, only need 2-3 hours to get fully recharged, and you can conveniently monitor the battery level via the LCD Screen. COMPACT & PORTABLE: KR-901 is not only powerful, as a laptop power bank, weights only 1 pound with dimensions of 6 x 4x 1.3 inches, can conveniently fits in your bag, suitcase or purse. Additionally, the shell is fire retardant, friction resistant/corrosion resistant/extrusion resistant, you can take it to anywhere with an easy mind. Ideal for home, office and travel use. LIFETIME WARRANTY: Worry-free 18-month Guarantee. Any problem, please feel free to contact us by checking Your Orders and clicking Contact Seller.